Property Description of 11 Van Fleet Circle, Heidi-Ho & Heidi-Too. As one travels down the road to the very quiet cul-de-sac of Van Fleet Circle, the 3-acre property comes into view on the left behind the large white yardarm flagpole. There sits the 4,000 square foot main house and the 1500 square foot carriage house. The 400-foot white lime stone driveway winds its way along the large landscaped grounds. At the end of the driveway on the right is the 18 X 36 heated pool and enclosed 9 X 6 spa. The two-bedroom carriage house overlooks the pool with a wrap around deck. The carriage house is complete with high speed internet, full kitchen, washer/dryer, two full baths, two 42 inch plasma televisions, two king bedrooms, and outside shower. The second floor master suite includes a large bathroom with tiled shower, a fantastic Jacuzzi tub, and deck overlooking the pool. The main house is impeccably decorated and maintained. The gracious entryway looks through the den to a fully screened in porch that over looks a large stone patio. The patio is great for entertaining guests with a large gas grill, triple shellfish boilers, and large picnic table, ideal for family gatherings. The spacious first floor has two twin bedrooms along with two full and one half baths. As well as a third bedroom complete with bunk beds and an additional full bed. A separate large laundry room provides entry via the two-car garage and the patio with outside shower. The first floor is great for entertaining guests and children. The second floor of this “Nantucket style upside down house” includes a large great room and outside decks with 180 degree views of the Atlantic Ocean. The great room is the best room in the house and is complete with a large 50” plasma screen TV surround sound and DVD/CD. The kitchen is a commercial cooks haven with two ovens, two dishwashers and two or three of everything else a chef would need. The large granite kitchen counters are surrounded by eight high back director chairs and a one of a kind spectacular, hand-painted, large dining table. On either end of the second floor are two king master bedrooms complete with full baths, beautiful decks over looking the large yard and ocean. The secluded and private compound is minutes from Tom Never’s Pebble beach. 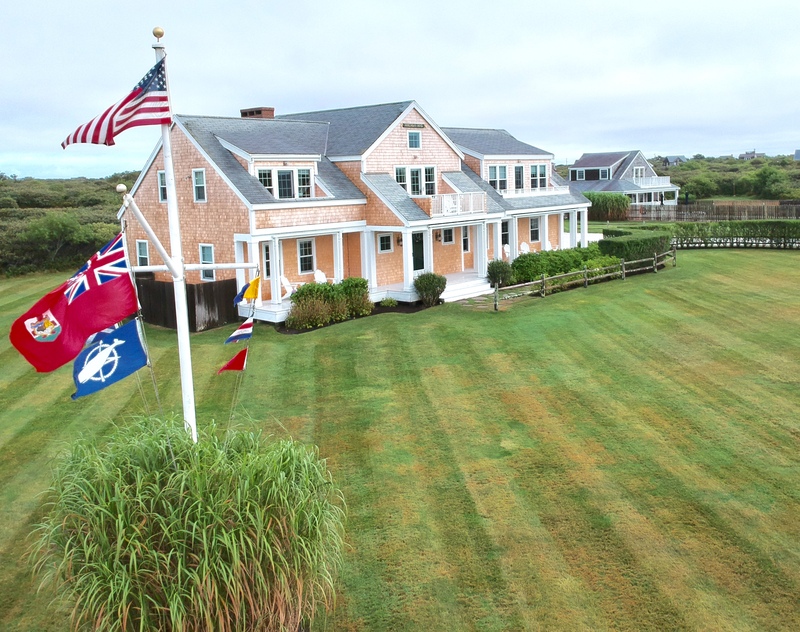 The Grand House, Carriage House and large pool provides an extraordinary Nantucket vacation setting. With seven bedrooms six and half baths, this compound is an unforgettable “gem” of clean quite peaceful living waiting to welcome your arrival.